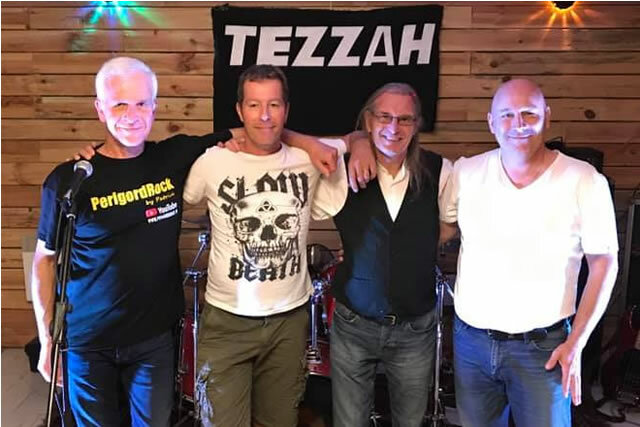 New venue for TEZZAH at Le Cent Pression on Saturday 13th April, looking forward to seeing all our friends and fans, for a top TEZZAH evening. Don't forget to regularly check out the Dates page to see where TEZZAH/TERRY "TEZZAH" HARRIS is appearing. Terry would like to say thank you for all the kind messages and well wishes. He is now recovering well from his bout of bronchitis and also the operation to remove the dialysis fistule from his left arm. The staples (42) are now out and the 3 scars are healing well. 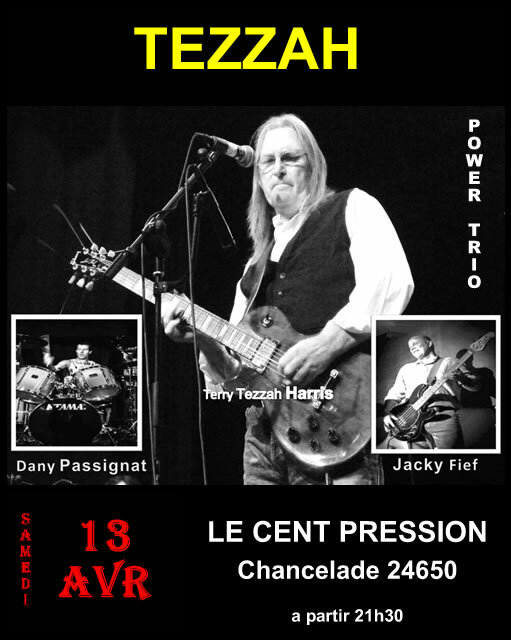 Terry will be back rehearsing on the 9th April for Tezzah's gig at Le Cent Pression on the 13th. Check out our Official You Tube Channel YONDABOSH Click Here. "Subscribe" "Like" and "Share" our "Videos" would be great. Don't forget to follow us on FaceBook. "Like" and "Share" our "Page" would be helpful. 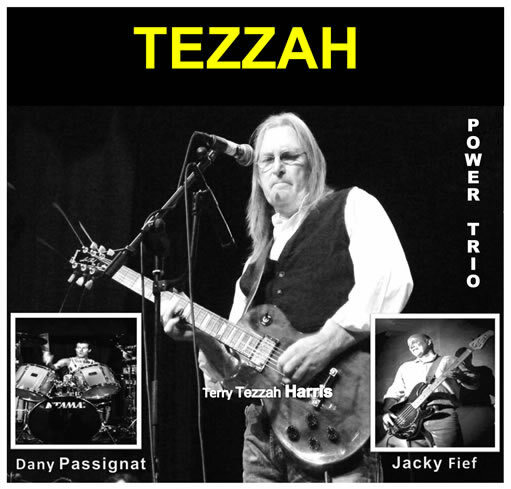 TEZZAH at Le Cent Pression, 24650 Chancelade, France, 13th April . 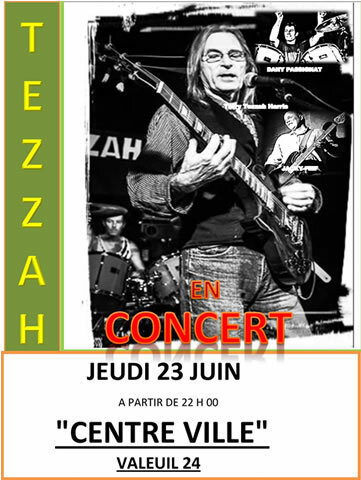 TEZZAH at Frit n'n Bier, Avenue Louis Suder, 24430 Marsac-sur-l'Isle, France, 9th June. or even on the odd occasion THE TERRY HARRIS BAND. Back at one our favourite venues Le Saloon on Saturday 16th March, looking forward to seeing all our friends and fans, for a top TEZZAH evening. Don't forget to regularly check out the Dates page to see where TEZZAH is appearing. 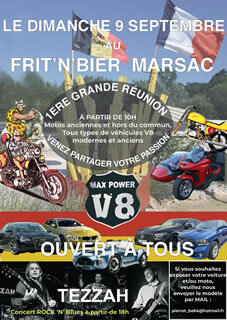 TEZZAH at Le Saloon, Route de Bergerac, 24660 Coulounieix-Chamiers, 16th March . Terry and Tezzah look forward to seeing you at these gigs and all through 2019. TERRY 'TEZZAH' HARRIS at Bars Relooking Jam, 24210 Bars, France, 1st February 2019. TEZZAH at VTT, 24000 Perigueux, France, 9th February 2019. 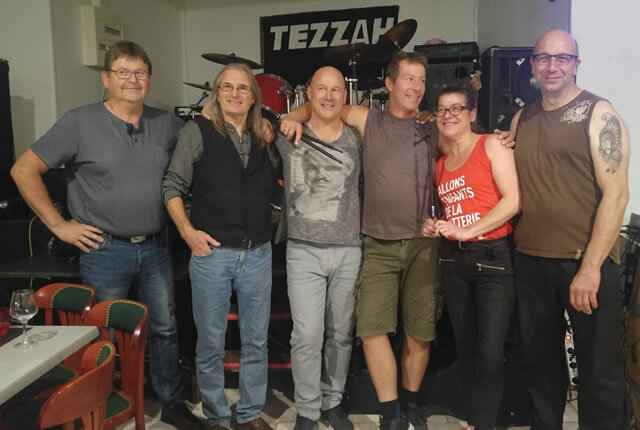 TEZZAH at Le Saloon, Route de Bergerac, 24660 Coulounieix-Chamiers, 16th March 2019. TEZZAH at Le Cent Pression, 24650 Chancelade, France, 13th April 2019. 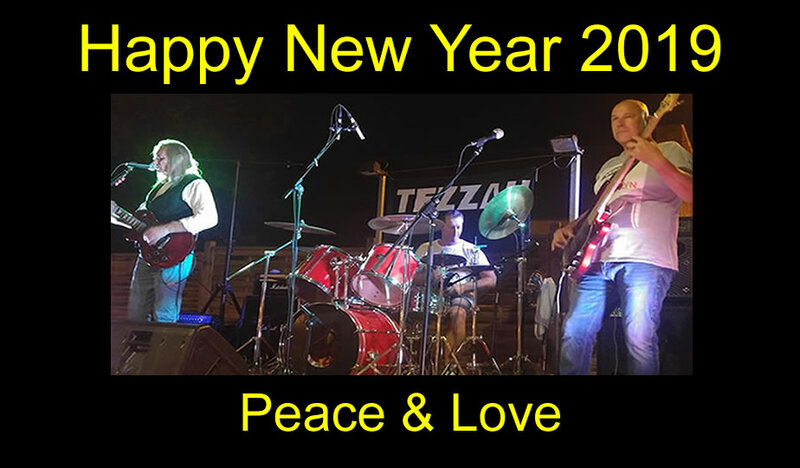 Tezzah (Terry Tezzah Harris gtr/voc, Dany Passignat drums/voc & Jacky Fief bass/voc) wish a very happy New Year to all our families, friends, fans and all the concert venues. Many thanks to everyone for your continued support. Elke Pelikan and Rock-Circle-Radio for playing our music throughout the year. Patrick Bittiger and PerigordRock for our Promo video. Yves Ferrec our sound engineer for all his help and hard work this year. To everyone, to many to name, who have "Liked" and "Shared" our posts and to everyone who came to our concerts. We hope it will be a year of peace and goodwill and look forward to seeing you all in 2019. Tezzah (Terry Tezzah Harris gtr/voc, Dany Passignat drums/voc & Jacky Fief bass/voc) souhaite une très bonne année à tous nos familles, amis, fans et toutes les salles de concert. Un grand merci à tous pour votre soutien continu. 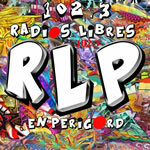 Elke Pelikan et Rock-Circle-Radio pour jouer notre musique. Yves Ferrec, notre ingénieur du son pour son aide et son bon travail cette année. À tous, à beaucoup d'entre eux, qui ont "aimé" et "partagé" nos Posts et à tous ceux qui sont venus à nos concerts. Nous espérons que ce sera une année de paix et de bonne volonté et espérons vous voir tous en 2019. 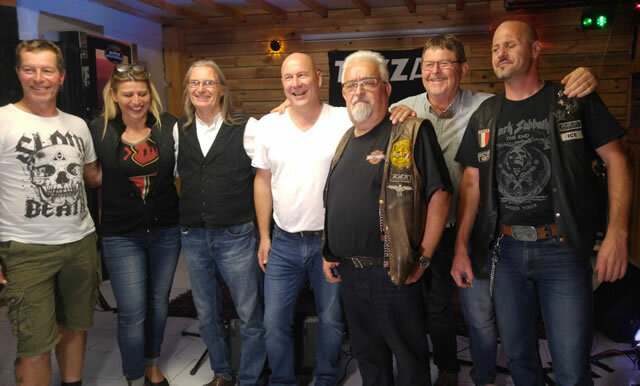 Tezzah (Terry Tezzah Harris gtr/voc, Dany Passignat drums/voc und Jacky Fief bass / voc) wünschen allen Familien, Freunden, Fans und alle Konzerthallenein ein gutes neues Jahr. Vielen Dank an alle für Ihre anhaltende Unterstützung. Elke Pelikan und Rock-Circle-Radio für das Spielen unserer Musik während des ganzen Jahres. Yves Ferrec, unser Sound Engineer, für all seine Hilfe und gute Arbeit in diesem Jahr. An alle, an die sich viele nennen, die unsere Beiträge "Like" und "Share" haben, und an alle, die zu unseren Konzerten gekommen sind. Wir hoffen, dass dies ein Jahr des Friedens und des guten Willens sein wird, und freuen uns, Sie alle im Jahr 2019 zu sehen. THE FEELIN' BLUES BAND, AQUAR'AILE, or even on the odd occasion THE TERRY HARRIS BAND. TEZZAH would like to say a big thank you to Patrick Bittiger/PerigordRock for the great promo video recently posted on the PerigordRock FaceBook page and web site. To see a short version on FaceBook Click Here, to see the full version on YouTube Click Here. To Check out PerigordRock (FaceBook) Click Here and to check out PerigordRock (web site) Click Here. After show pic with TEZZAH + THE BLUEBIRDS (l-r Dany Passignat, Terry Tezzah Harris, Jeff Gautier, Hervé Fernandez, Jacky Fief & Giles Forrester. Click on the pics for larger versions. Don't forget to check out our Photo Gallery for other pics. Use the "Drop Down" Menu to select a series of photos. Loads of other photos and videos on our TEZZAH FaceBook Page as well. TEZZAH are opening for THE BLUEBIRDS at Le Bistrot Gourmand Bars 16th November. Looking forward to seeing you all there for a great night of Tezzah Rock 'n' Blues. Another great gig at Le Saloon we will be back on the 2nd March next year. Great after show pic with Jean-Louis, Agnes and Gaëtan. Click on the pics for larger versions. Don't forget to check out our Photo Gallery for other pics. Use the "Drop Down" Menu to select a series of photos. Loads of other photos and videos on our TEZZAH FaceBook Page as well. TEZZAH at Le Bistro Gourmand, 24210 Bars, France, 16th November. We are back at Le Saloon on the 20th October. A great venue, so come along for some Tezzah rock 'n' blues. A couple of nice after show pics with Pierrot (Frit 'n' Bier) and Valerie and Vincent (L'Estaminet). Click on the pics for larger versions. Don't forget to check out our Photo Gallery for other pics. Use the "Drop Down" Menu to select a series of photos. Loads of other photos and videos on our TEZZAH FaceBook Pages as well. 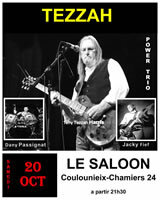 TEZZAH at Le Saloon, Route de Bergerac, 24660 Coulounieix-Chamiers, 20th October. TEZZAH at Le Broadway, 7 boulevard de l'Horizon, 24430 Marsac sur l'Isle, France, 24th November. Great gigs at the Hollywood Cafe and the Le Bistrot Gourmand and some good video, which we hope to put on our Official You Tube Channel YONDABOSH Click Here, and our FaceBook Page very soon. TEZZAH at Frit 'n' Bier, 24430 Marsac-sur-l'Isle, France, 9th September. Don't forget the early start. Looking forward to seeing you all there for a great afternoon of Tezzah Rock 'n' Blues. 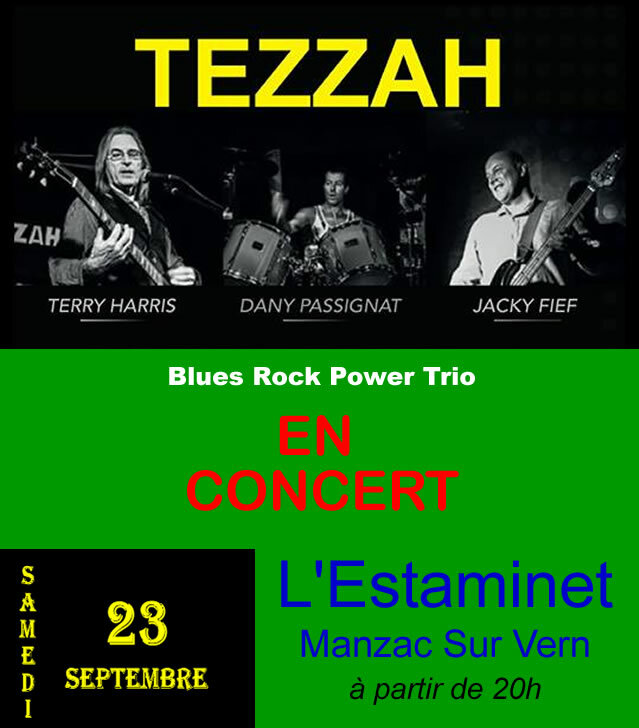 TEZZAH at L'Estaminet, 24110 Manzac Sur Vern, France, 15th September. Back again at this great venue. Looking forward to seeing you all there for a great night of Tezzah Rock 'n' Blues. TEZZAH at Frit n'n Bier, Avenue Louis Suder, 24430 Marsac-sur-l'Isle, France, 9th September. Looking forward to seeing you all for more great nights of Tezzah Rock 'n' Blues. TEZZAH at Le Bistro Gourmand, 24210 Bars, France, 11th August. After a busy first half of 2018 TEZZAH and Terry Tezzah Harris are taking a short break. 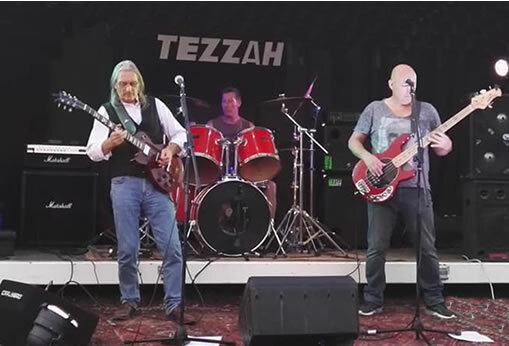 Looking forward to seeing you all in late July for more great nights of Tezzah Rock 'n' Blues. 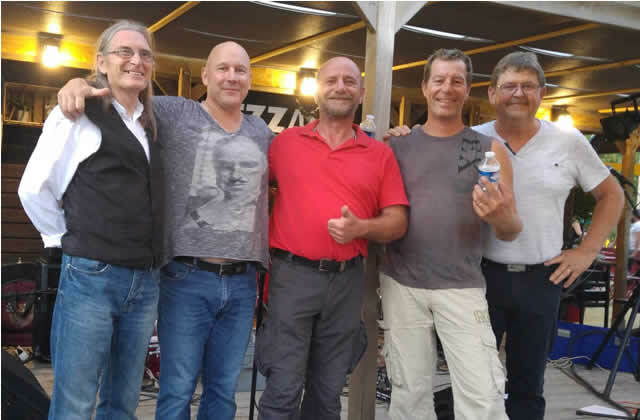 FEELIN' BLUES BAND at Bar Chez Cathy, 24440 Saint-Avit-Sénieur, France, 20th July. 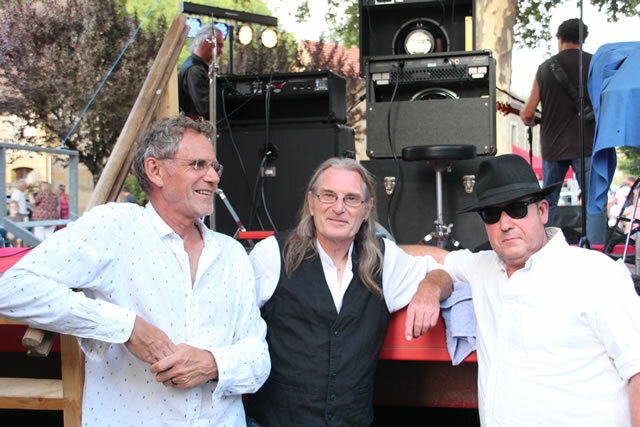 FEELIN' BLUES BAND at Montignac Rugby Club, 24290 Montignac, France, 22nd July. TEZZAH at B.O.S MC24, 24660 Coulounieix-Chamiers, France, 2nd June.. Looking forward to seeing you all there for a great night of Tezzah Rock 'n' Blues. TEZZAH at Fête de la Musique, 24210 Bars, France, 21st June. Looking forward to seeing you all there for a great night of music with a great line up of musicians and groups organised by Jeff Gauthier. 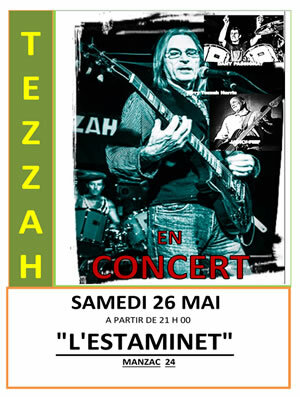 TEZZAH at L'Estaminet, 24110 Manzac Sur Vern, France, 26th May. FEELIN' BLUES BAND at L' Montignac , 24290 Montignac, France, 1st June. TEZZAH at B.O.S. MC24, 24660 Coulounieix-Chamiers, France, 2nd June. 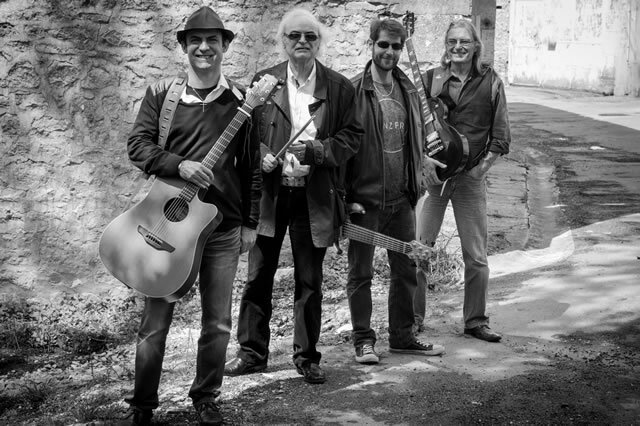 FEELIN' BLUES BAND at L'Emboscada, 24290 Montignac, France, 16th June. TEZZAH at Fete De La Musique, 24210 Bars, France, 21st June. TEZZAH at Valeuil, 24310 Valeuil, France, 23rd June. Interview withTEZZAH's Terry Tezzah Harris and Jacky Fief 10th May 12 noon, on the "France Bleu Périgord Midi" show. TEZZAH at Radio France Bleu Périgord, Radio Interview, 10th May. TEZZAH at Private Party, France, 9th June. The Terry Harris Band with Jacky Fief (bass) and Dany Passignat (drums) will be at Jeff Gauthier's Le Bistrot, 24210 Bars, France on the 14th April for a British Blues Night Jam. Hope to see you all there. Terry Tezzah Harris and Jacky Fief will be with the Feelin' Blues Band, at Bar Chez Cathy, 24440 Saint-Avit-Sénieur, France, 20th April 2018. 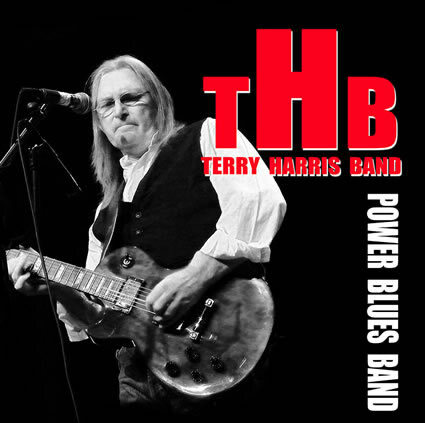 TERRY HARRIS BAND at Le Bistrot, 24210 Bars, France, 14th April. FEELIN' BLUES BAND at Bar Chez Cathy, 24440 Saint-Avit-Sénieur, France, 20th April. 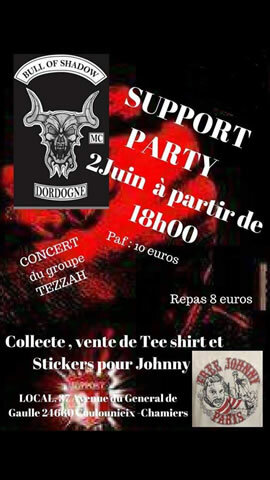 TEZZAH at L'Estaminet, 24110 Manszac Sur Vern, France, 26th May. FEELIN' BLUES BAND at L'Montignac, 24290 Montignac, France, 1st June. Terry Tezzah Harris will be with the Feelin' Blues Band, at Watson's Pub, 24000 Perigeueux, France, 17th March 2018. FEELIN' BLUES BAND at Watson's Bar, 2400 Perigueux, France, 17th March. FEELIN' BLUES BAND at Paradisio, 24290 Montignac, France, 19th May. 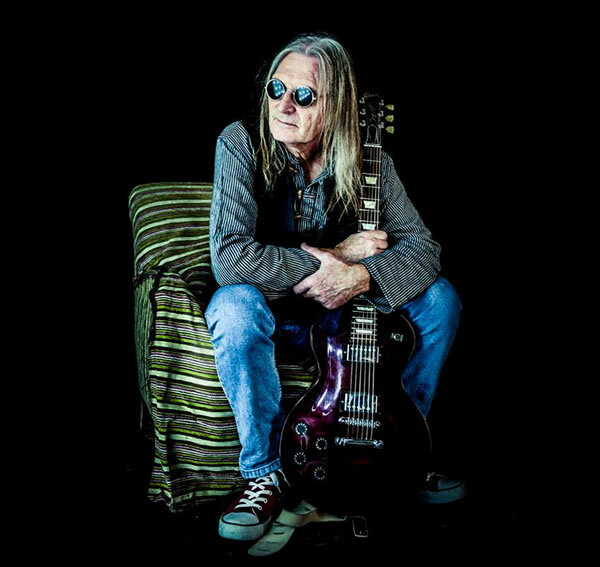 Don't forget to regularly check out the Dates page to see where Terry is appearing with TEZZAH, THE FEELIN' BLUES BAND, AQUAR'AILE, or even on the odd occasion THE TERRY HARRIS BAND. TEZZAH at Le Saloon, Route de Bergerac, 24660 Coulounieix-Chamiers, France, 10th February 2018. The Terry Harris Band with Jacky Fief (bass) and Dany Passignat (drums) will be at Jeff Gauthier's Le Bistrot, 24210 Bars, France on the 24th February for a British Blues Night Jam. Hope to see you all there. 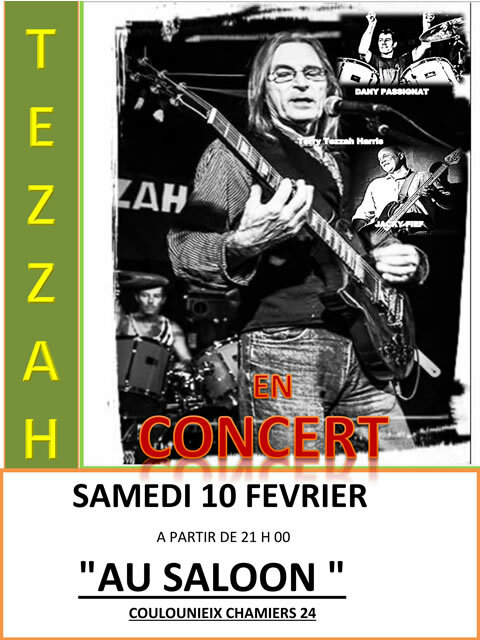 TEZZAH at Le Saloon, Route de Bergerac, 24660 Coulounieix-Chamiers, France, 10th February. 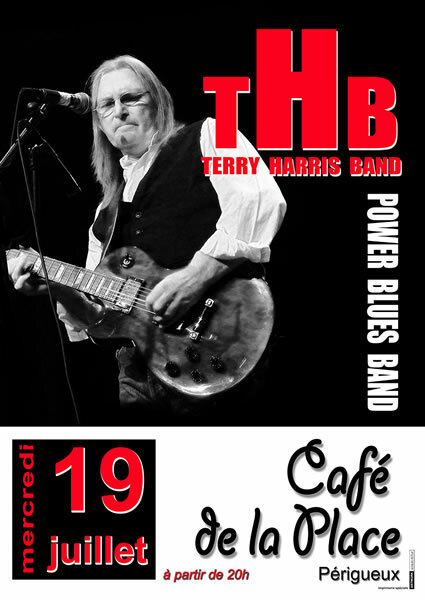 TERRY HARRIS BAND at Le Bistrot, 24210 Bars, France, 24th February. 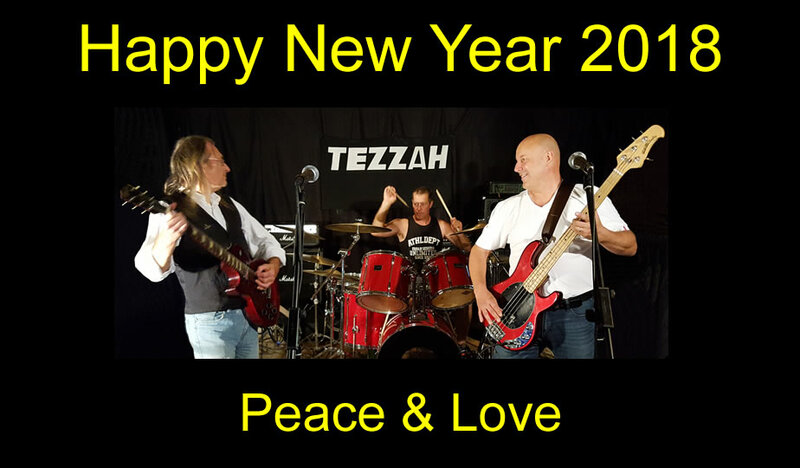 Tezzah and Bish Bash Bosh Music wish a very happy New Year to all our friends and fans. Many thanks to everyone for your continued support. 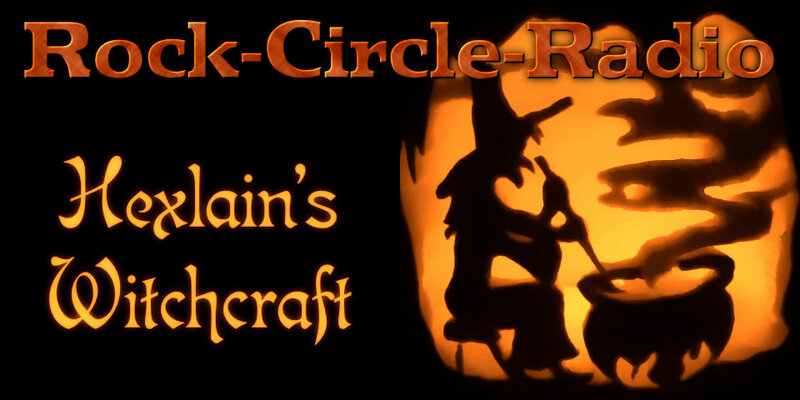 A very special thank you, to Elke Pelikan and Rock-Circle-Radio for playing our music throughout the year. We hope it will be a year of peace and goodwill and look forward to seeing you all in 2018. More TEZZAH on the radio, Friday 15th December, 20h00 - 22h00 (listeners in the UK 19h00 - 22h00). Check out YouTube, we have uploaded a live version of Can't Hear You Say, filmed on a mobile phone at our rehearsal studios. Don't forget to "LIKE" and "SUBSCRIBE", many thanks from TEZZAH for all your support. The Terry Harris Band with Jacky Fief (bass) and Dany Passignat (drums) will be at Jeff Gauthier's Le Bistrot, 24210 Bars, France on the 2nd December for a British Blues Night Jam. Hope to see you all there. FEELIN' BLUES BAND at Bar Chez Cathy, 24440 Saint-Avit-Sénieur, France, 17th November. 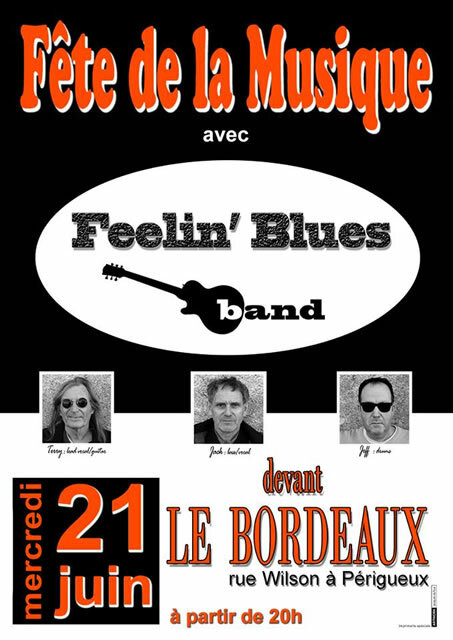 FEELIN' BLUES BAND at Bar Les Toques, 24000 Perigueux, France, 29th September. TERRY TEZZAH HARRIS at Le Bistrot, 24210 Bars, France, 2nd December. Check out our version of "Hey Joe"on FaceBook. Don't forget to "LIKE" our page. More TEZZAH on the radio, Friday 6th October, 20h00 - 22h00 (listeners in the UK 19h00 - 22h00). Check out our short "Cover Video"on FaceBook. More TEZZAH on the radio, Friday 8th September, 20h00 - 22h00. FEELIN' BLUES BAND at Barnabe, 24000 Perigueux, France, 29th September. 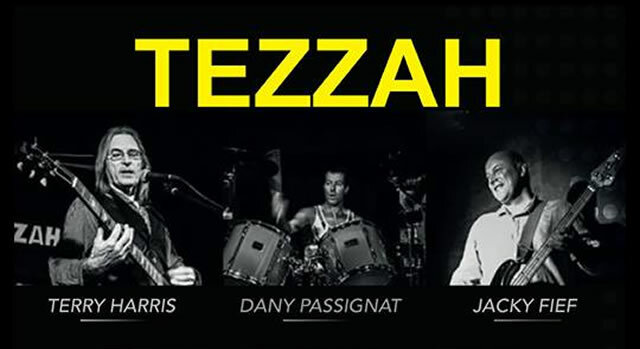 TEZZAH at L'Estaminet, 24110 Manszac Sur Vern, France, 23rd September. 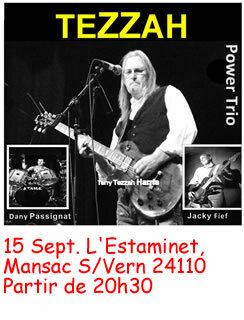 TERRY HARRIS BAND at Au Bassin, 24000 Perigueux, France, 14th September. 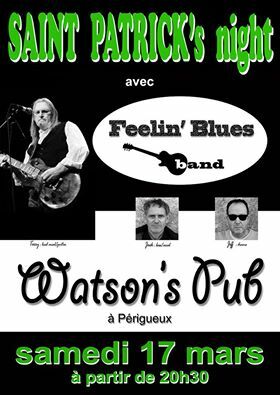 FEELIN' BLUES BAND at Watson's Bar, 24000 Perigueux, France, 13rd September. TEZZAH at Private Concert, France, 1st September. TEZZAH on the radio, Friday 18th August, 20h00 - 22h00. Date for the diary, TEZZAH at L'Estaminet, 24110 Manszac Sur Vern, France, 23rd September 2017. Don't forget to follow us on FaceBook. "Like" and "Share" would be helpful. The "one off" Terry Harris Band gig is now two. Again with Jacques Dufour (bass) and Jeef Monteil (drums) on the 14th July, Au Bassin, Perigueux, France. 2nd August saw Terry Tezzah Harris with The Feelin' Blues Band at the "Festival De Rock” at Peyzac Le Moustier, France. 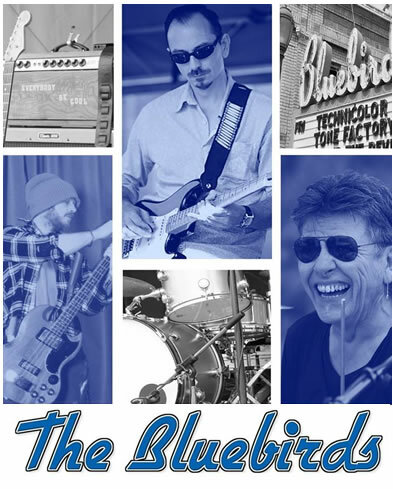 Check out our Feelin' Blues Band page, or for their FaceBook Page click here . 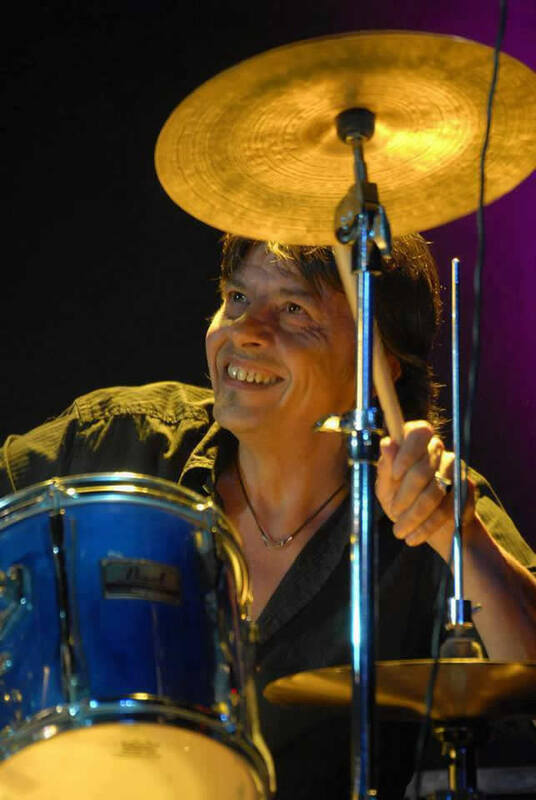 Don't miss a one off Terry Harris Band gig with Jacques Dufour (bass) and Jeef Monteil (drums) on the 19th July, Cafe De La Place, Perigueux, France. 9th July saw Terry Tezzah Harris with Aquar'aile at the "L’Amérique s’invite à DIRAC Festival” at Dirac, France. Check out our Aquar'aile page, or for their FaceBook Page click here . June saw a visit from our great friend and photographer Andy Hurst for a photo shoot. We have posted some on FaceBook check them out. 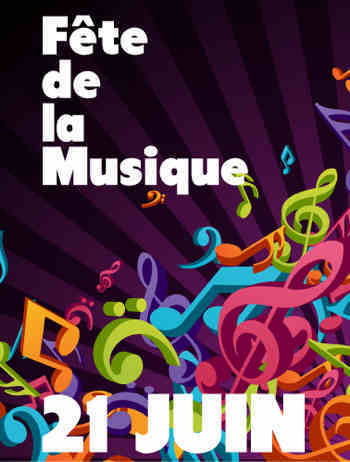 June 21st saw Terry Tezzah Harris with one of his projects, The Feelin' Blues Band, taking part in the Fete De La Musique. A day given over to music. Large towns and cities such as Perigueux close all roads, in to the city to traffic, and position groups of all types, Blues Rock, Jazz etc throughout. A brilliant evening, although a tad hot at 30 degrees C at midnight. Great end to the month of May (29th & 30th) and begining of June (1st) with Retina having air time on the John Miller Show (Radio RLP). To check ot our other videos on YOUTUBE click here. Don't forget to regularly check Tezzah.com, FaceBook and YouTube for all our news and dates and to see where Terry Tezzah Harris is performing. 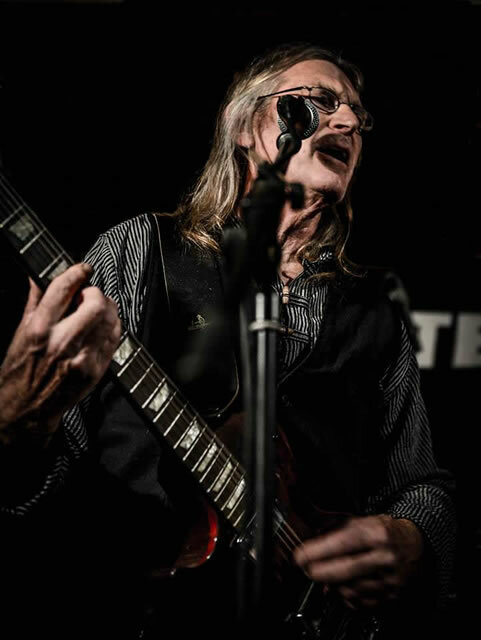 Tezzah guitarist Terry Tezzah Harris had gigs with Aquar'eile on the 1st May at Chazelles, France and with The Feelin' Blues Band on the 27th May at the Place St Silain, Perigueux, France, plus an evening at The Bistrot, Bars, France. As always a big thank you to all the musicians involved, Yves, Fred Fetis and Matthias Bessonnet, incidentaly making his debut with the band (Aquar'eile) and Jeef Monteil & Jacques Dufour (The Feelin' Blues Band) and Jeff Gautier, Peter Chadwick, Pascal Evrad, & Terry Denby (Bars) and not forgetting all our friends and fans that come to see our shows. Don't forget to keep track of us on FaceBook and YouTube as well as our "Dates" pages to see where Terry Tezzah Harris is performing. 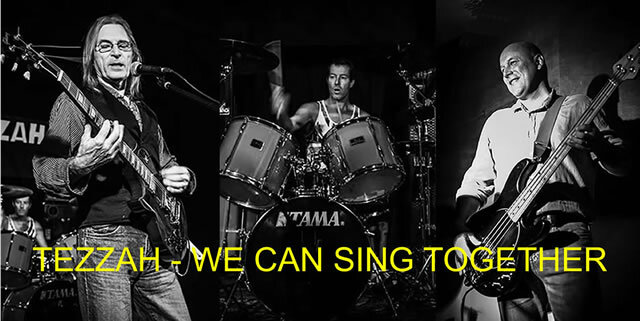 We have uploaded toYouTube live clips of We Can Sing Together and Sunshine Of Your Love , filmed on a mobile phone at, Le Bistrot, Bars, France. We have added a page for Aquar'aile. Aquar'aile, another project of Terry Tezzah Harris, was formed after Terry and Yves Fetis met while touring with the Fran Normand band. TEZZAH played a super gig on the 8th April at Jeff Gautier's, Le Bistrot, Bars, France. Terry Tezzah Harris, Dany Passignat and Jacky Fief wish to thank Jeff Gautier and Marianne Valtier for their warm welcome and hospitality, and not forgetting all our friends and fans that came to see us making it a very special show. Don't forget to keep track of TEZZAH on FaceBook and YouTube as well as our "Dates" pages to see where Terry Tezzah Harris is performing. 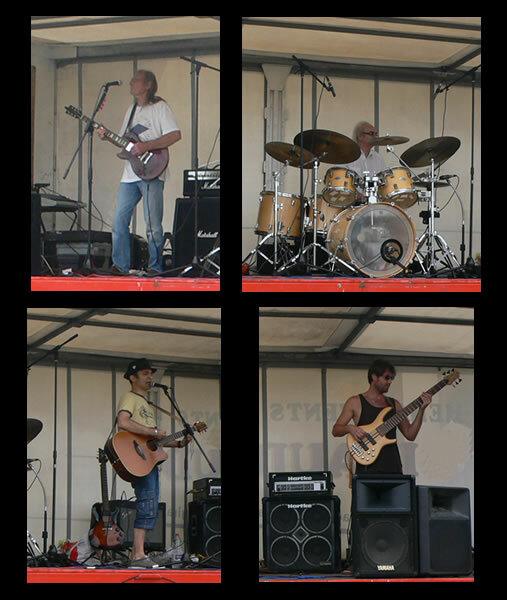 We have added a page for The Feelin' Blues Band. Formed by drummer Jeef Monteil, in June 2016, Terry Tezzah Harris has been guitarist/vocalist with the band since it's inception. Tezzah guitarist Terry Tezzah Harris had gigs with all his projects this month. Tezzah, The Feelin' Blues Band and Aquar'eile and an appearance at The British Blues Evening. 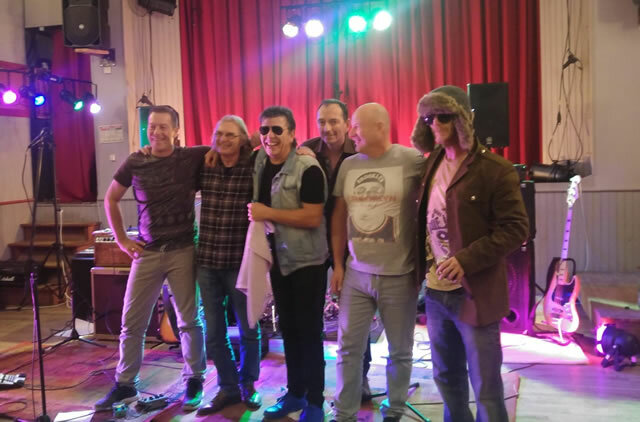 Big thank you to Dany Passignat and Jacky Fief (Tezzah), Yves & Fred Fetis (Aquar'eile) and Jeef Monteil & Jacques Dufour (The Feelin' Blues Band) and Jeff Gautier for organising the The British Blues Evening, and not forgetting all our friends and fans that come to see our shows. Don't forget to check out the "Dates" pages to see where Terry Tezzah Harris is performing with Tezzah or one of his other current projects. 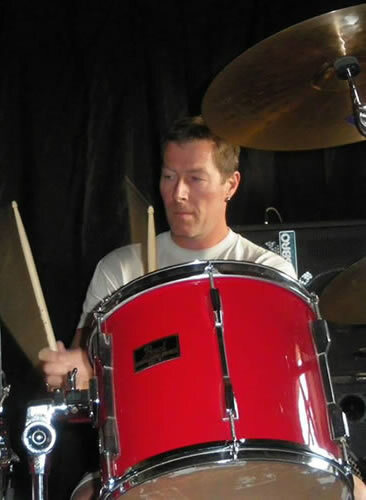 Terry Terry Harris's current projects are: Tezzah, The Feeling Blues Band and Aquar'aile. We will upload further information and pages in the near future. We hope 2017 will be a year of peace and goodwill. We look forward to seeing you all in 2017.